With Prime Minister Justin Trudeau poised to possibly travel to China soon, a Conservative senator plans to shine a spotlight on human rights abuses in its Himalayan region of Tibet. Sen. Dennis Patterson plans to use the procedural rules of the upper chamber today to draw attention to what he says are human rights abuses in Tibet, which has been under the Chinese Communist party's control since 1951. "It's a message to the government there are important human rights issues not to be ignored in engagement with China," Patterson said in an interview. The prime minister of Tibet's government-in-exile says Canada ought to tread cautiously as it pursues deeper economic ties with China, including a possible free trade deal. "You should not give a free pass for human rights, for basic values of Canada. You can't compromise on that," said Lobsang Sangay, who became the head of the government-in-exile in 2011 replacing the Dalai Lama, who is now solely focused on being the Tibetan spiritual leader. The Liberal government has yet to decide if it will purse formal free trade negotiations with China, but has recently completed a round of public consultations. Trudeau is reportedly considering a trip to China in the coming weeks to pursue the government's agenda of diversifying trading and investment opportunities to Asia. 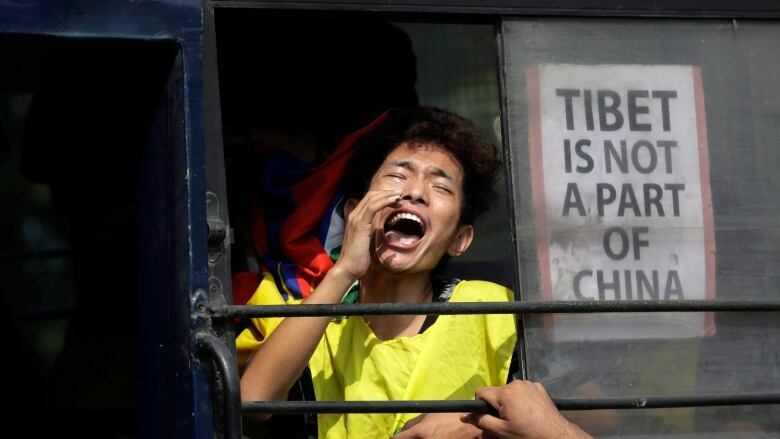 China doesn't recognize the Dalai Lama or his government-in-exile and considers him a dangerous separatist. It also does not take kindly to foreign governments giving attention to the Tibet issue. That includes meeting the Dalai Lama or his political leaders. "China will not buy more goods from Canada just because there is an agreement," he said. "If it's not a good deal, they won't buy." Canada and China established a high-level political dialogue that calls for yearly visits between leaders and Trudeau's turn is coming up. Canada and China have also opened a human rights dialogue as part of their renewed engagement under the Trudeau government. Sangay said Canada should engage with China on rights and have "frank discussions as a friend." "I'm confident that the tone of discussion will be respectful and it will not be provocative," said Patterson. "I think we'll be careful not to undermine the cause we believe in by being provocative and antagonistic when it comes to our discussions of China." Patterson said after meeting Tibetan Canadians earlier this year he was struck by what he saw as the similar threats to culture faced by Tibetans and Canada's Inuit community, which he represents. "We're struggling in Nunavut with the preservation of language as a carrier of Inuit culture," said Patterson. International Trade Minister Francois-Philippe Champagne said Wednesday that Canada is seeking "modern, high-standard trade agreements" with China and throughout Asia.